[시사뷰타임즈] 오하이오 주에 사는 한 여자는, 자신이 구해주었던 보아 구렁이가 목을 휘감더니 얼굴을 깨물기 시작하자 911에 전화를 걸지 않을 수 없었다. 목요일, 소방관들은 쉐필드 레잌에 있는 오하이오 주 작은 마을에 사는 이 여자에게로 황급히 가서 165cm 길이의 구렁이 목을 주머니 칼(주: 맥가이버 칼이라고 불리는 것)로 따버렸다. 이 극적인 사건은 이름을 밝히지 않은 여자가 현지시각으로 오후 2시경 911 비상구조대에 전화를 걸면서 시작됐다. “제발 도와주세요. 보아 구렁이가 내 얼굴에 달라붙어 있습니다” 라고 이 여자는 교환수에게 말했다. 깜짝 놀란 비상차량 배차 담당원은 “부인, 당신에게 뭐가 있다구요?”라고 물었다. 그러자 이 여자는 자신의 주소를 알려주면서 담당원에게 자신은 하루 전날 이 뱀을 구조해주었을 뿐이었다고 말했다. 혼동에 빠진 담당원은 이 여자가 정확히 상황을 말해 주기 전에 “당신이 어제 보아 구렁이를 저지했다구요?”라고 물었다. “이런 이야긴 전혀 들어본 적이 없습니다”라고 담당원이 비상구조요원에게 말하는 소리가 (전화기 너머로) 들렸다. 구급차들과 소방관들이 해당 지점으로 가고 있는 상태에서도 담당원과 피해자 간의 기괴한 대화는 계속됐다. 놀라있는 여자는 “보아가 내 코를 깨물고 있어요, 사방이 피 투성입니다.”라고 외쳤다. 그러더니 이 여자는 자신이 하루 전날 보아 구렁이 두 마리를 구해 주었으며 또 총 합해서 뱀 11마리가 자신에게 있다는 것을 설명했다. 담당원을 칭찬할만 한 것은, 이 여자 담당원이 놀라있는게 충분히 이해되는 피해자를 진정시키기 위해 최선의 노력을 다 하고 있었다는 점이다. 전화통화가 끝날 때쯤 되자, 사이렌 소리가 울어대는 것이 배경음으로 들리면서 담당원은 전화를 끊었다. 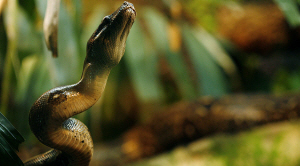 An Ohio woman was forced to place a 911 call after a boa constrictor she rescued turned on her, wrapped itself around her neck, and began biting her face. Firefighters raced to the woman’s house in the small Ohio town of Sheffield Lake on Thursday and cut the 5 1/2-foot-long serpent’s head off with a pocket knife. The drama began when the unnamed woman placed a frantic 911 call to emergency services about 2pm local time. “Help please, I’ve got a boa constrictor stuck to my face,” she told the operator. “Ma’am you have a what?” the stunned dispatcher replied. The woman then proceeded to give her address and told the operator that she had just rescued the snake the day previous. “You arrested the boa constrictor yesterday?” the confused dispatcher asked, before the victim set the record straight. “I’ve never heard of this before,” the dispatcher can then be heard saying to emergency personnel. With ambulances and firefighters on the way, the dispatcher and the victim continued their bizarre conversation. “It’s biting my nose, there’s blood everywhere,” the frightened woman exclaimed. She then goes on to explain that she rescued two boa constrictors the day before and that she has 11 snakes altogether. To the dispatcher’s credit, she tries her best to calm down the understandably frightened victim. Towards the end of the call, sirens can be heard wailing in the background and the operator hangs up.